An Iraq war veteran who had once received a purple heart has been jailed in the brutal slaying of his 19-year-old live-in girlfriend. 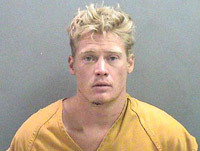 Police say John Wylie Needham, 25, beat Jacqwelyn Joann Villagomez to death after Needham's ex-girlfriend arrived at their San Clemente condo. Investigators allege a fight took then place between the ex-girlfriend and Villagomez. Needham separated the two and moments later 911 was called to "keep the peace" while the ex gathered her belonging from the condo. After the ex left, it is believed that Needham for whatever reason beat Villagomez to death, leaving her to die in a back room. Later, police finally arrived and knocked on the door. Needham answered the door naked and a confrontation took place. Deputies had to tase Needham, and police then searched the condominium where they found the severely beaten Villagomez. She was taken to a hospital quickly thereafter, but was later pronounced dead. Besides the above archived MySpace profile, Needham also maintained several blog entries all which can be found here.